Mount Royal University’s library had its first expansion earlier this month, but it had nothing to do with the new learning centre expected to open in 2017. 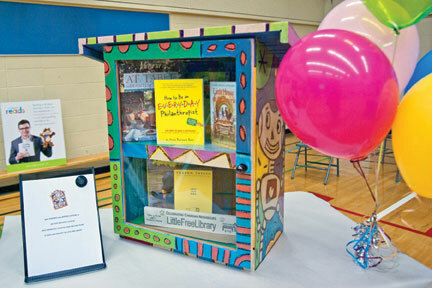 Instead, a small wooden cabinet was placed on Main Street, filled with books for students to read. The project is known as the Little Free Library (LFL) and the idea is that each location is home to a free book exchange. So, if you’re looking for a book, you can find something new to read, and if you’re finished reading a book, you can leave it at any LFL. As a result, the catalogues of each LFL is unique and constantly changing — so there will always be something new. As the name implies, each Little Free Library is completely without cost to users, and operates based on the involvement of the community. The idea is the brainchild of Todd Bol from Wisconsin. Modelled after an old schoolhouse, he built the first LFL in 2009, and the premise quickly caught on. Since then, these boxes of books have been popping up all over the world, and thanks to Calgary Reads, we have one right here at Mount Royal. “It really connected with the work we do at Calgary Reads, of course, trying to get more books into the hands of people, and trying to get people really passionate about books,” said Anita Hofer, Director of Communications at Calgary Reads. Calgary Reads has sponsored six LFLs so far, and is hoping to add to that in the future. “We actually did a Little Free Library launch in the Fall. We started our own sort of mini-project where we’re [got] folks to build Little Free Libraries for us and match those up with artists. 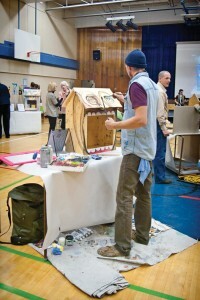 We had a number of really amazing Calgary artists do some of our Little Free Libraries,” said Hofer. Lane Shordee, a local “scavenger artist” who repurposes construction waste and other tossed-away items into works of art, was the creative force behind the décor of Mount Royal’s LFL. “We want to get all of the Little Free Libraries in Calgary registered on a map that we can have, so we’re working towards that,” added Hofer. In an email, Hofer also said that the project recently received a grant from The Calgary Foundation, so more LFLs are on the way. According to Hofer, the purpose of the project is to foster a strong sense of community centred on a love and passion for reading. To get involved yourself, contact Calgary Reads at volunteer@calgaryreads.com. You can also follow Mount Royal’s Little Free Library on Twitter at @LFLMRU.